Anja Aropalo is a middle-aged literature professor whose husband suffers from early Alzheimer’s disease. She swore to help him die once he began to lose his memory, but she struggles with her promise and doesn’t know when to step in. Meanwhile, her 16-year old self-mutilating niece, Mari, blossoms as she falls in love with her teacher. When he tries to end their affair, she starts cutting herself again. The passionate love between the student and teacher is witnessed by the innocent eyes of the elder’s 6-year old daughter. The author elegantly weaves these characters, and their tragic stories, showing how different generations struggle with life and also with death. In vivid, incandescent prose, Riikka Pulkkinen reveals how our limits can show us who we really are. A play based on The Limit premiered in 2012 and the filming of a TV adaptation came out in 2014. Pulkkinen exhibits a rare perceptiveness, an ability to see the human and the humane, and a mature command of expression. 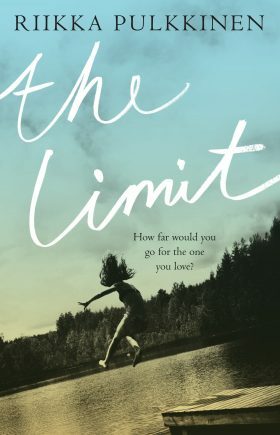 Pulkkinen achieves something rare: she creates tension without the slightest flirt with the thriller genre, merely by arousing genuine interest in whether her characters will live or choose to die. At its best this is a wise and poetic novel, steeped in romance and regret, tracing the profound ways in which we can be haunted by the past.